These are products sold by retailers related to Business Objects that we believe you might find resourceful. We offer no guarantees (except for our guides), just recommendations based on personal experience or the feedback of others. If you have a Business Objects related product that you would like to recommend please send us an email and we will add it to the list. Increase your efficiency with this rich compilation of best WebI functions, syntax, tips, operators right at your fingertips. 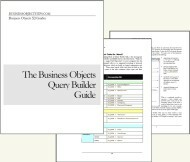 The most comprehensive, best-selling Business Objects Query Builder guide in existance. Take control of your BO metadata; get this guide. No one here is getting any younger, so anyone interested in the best eye cream that money can buy. I am know that I am not, not the time nor patience to use it; however, a shameless plug never hurt anyone.